Mastergrade Adirondack spruce top and gorgeous Brazilian back and sides! Payments as low as $220/mo. Or, apply & pay as little as $220/mo. This is what it's all about, folks! This OM and its cousin, a dreadnought in the same tonewoods, are the finest instruments we've yet to receive from our good friend, Robin Boucher. And that's saying something! Boucher's subtle, expert eye for tonewoods developed after decades of buying and selling along with his unique build philosophy that brings together vintage and modern tonalities have resulted in instruments that frequently take guests by complete suprise here in our showroom. This is the kind of guitar that will make a beginner feel like a master and a master realize just how much more music there is to play. Whether you're throwing everything you've got at it or just running scales, this superlative OM will leave players of every stripe from Jazz to Country to Classical wanting just a few minutes more! 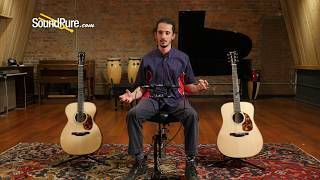 In this video, Sound Pure acoustic guitar specialist Barret Brooks compares 2 Boucher Bluegrass Goose acoustics: and OMH and a Dreadnought. Both guitars have Adirondack spruce tops and Brazilian Rosewood back/sides. 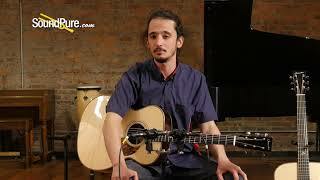 In this video, Sound Pure acoustic guitar specialist Barrett Brooks describes and demonstrates a Boucher Bluegrass Goose OMH Addy/Brazilian Rosewood Acoustic.